middle initial either J. or M.
"Mrs. Pilcher," indicating perhaps that Mary Drouin McCormick remarried sometime between 1914 and 1922.
census info for McCormick family at bottom of this page. IF ANYONE STUMBLES ACROSS THIS PAGE WHO BELIEVES THEY MAY BE RELATED TO, OR KNOW ANYTHING ABOUT, JESSIE MCCORMICK'S FAMILY, I WOULD LOVE TO HEAR FROM YOU (jihardi@att.net). Click on image to enlarge. Once enlarged, to zoom, move cursor to right of image, back onto image, and click again. More photos of the girls and Joe on their pages. 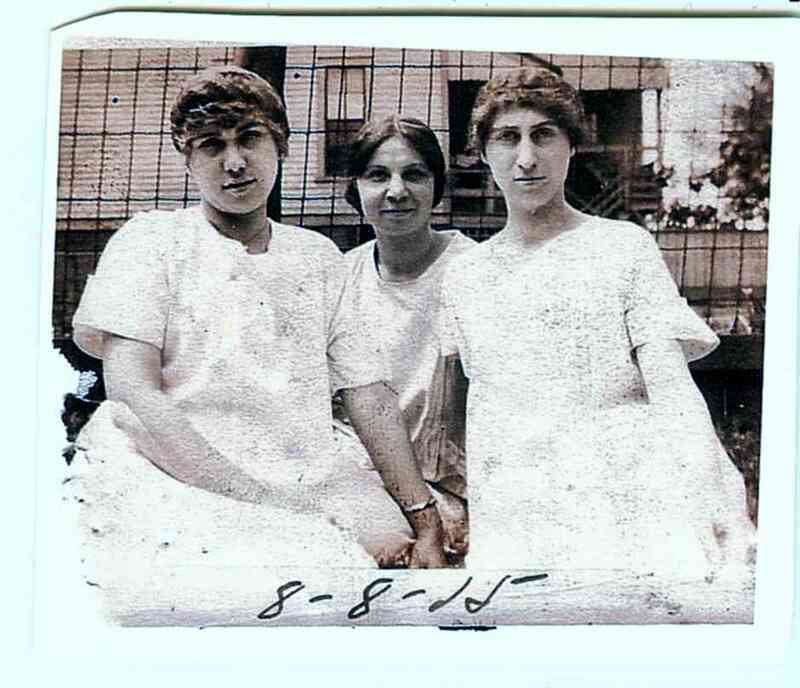 Probably Jessie on the lower left, with her mother-in-law Anna Wachdorf to the right, and her sister-in-law, Madge Wachdorf behind. No i.d. for kids. 9-21-1914 Marriage License (above in photo gallery) lists Joseph G. Wachdorf, age 22, permitted to marry Miss Jessie McCormick, age 21. At the bottom Edward Mallon, priest, certified that he performed the marriage 10-6-1914, but I can not make out the name that Old St. Mary's is listed under. 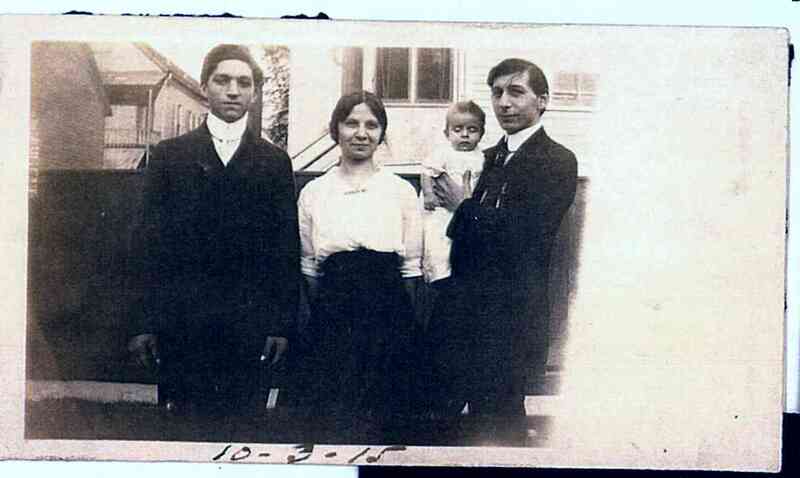 10-6-1914 (per Archdiocese records, register of Old St. Mary's, Chicago, obtained by Joe's granddaughter): husband = Joseph G. Wachdorf of 316 W. 58th St., shipping clerk, age 22, son of Anton Wachdorf from Germany and Anna "Kline" from Chicago, religion Catholic. Wife = Jessie J. McCormick of 346 W. 58th St., age 21, single, daughter of Charles McCormick from Boston, Mass. and Mary Drouin from France, religion Catholic (Note: license 677405 bride a convert, banns dispensed). Witnesses = Andrew P. Miller and Coletta Wachdorf. Priest = Edward T. Mallon C.S.P. 1917 draft registration: Joseph George Wachdorf of 216 W. 61st St, born 6-6-1892, shipping clerk for Tricolator of 64 E. Lake St. Medium height and slender with brown eyes and dark brown hair. Dependents: wife and two children. Reason for exemption: sole support of family. 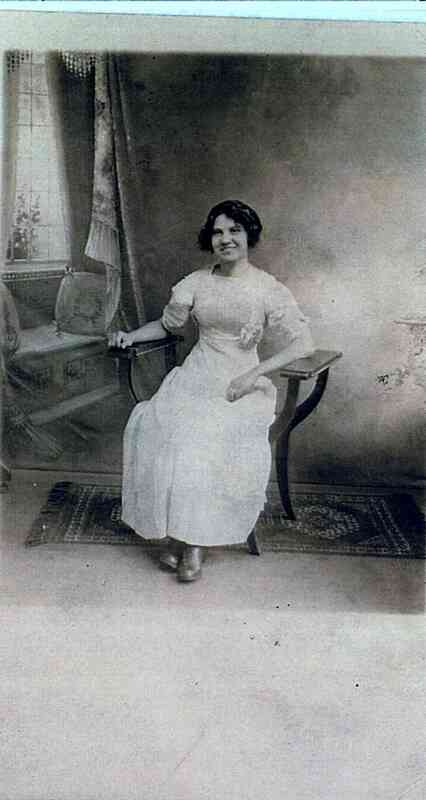 One of Joe's granddaughters sent for her mother's orphanage records. They show that Jessie and Joe separated (as in the framed info box above) and she died in 1922 of peritonitis. She is buried in Mt. Olivet Cemetery, Chicago. Chester M. McCormick, veteran of World War I, birth date February 12, 1897, age 50 years 9 months 19 days, born Chicago, employed as Electrician. SSN 362-22-2939, married white male. 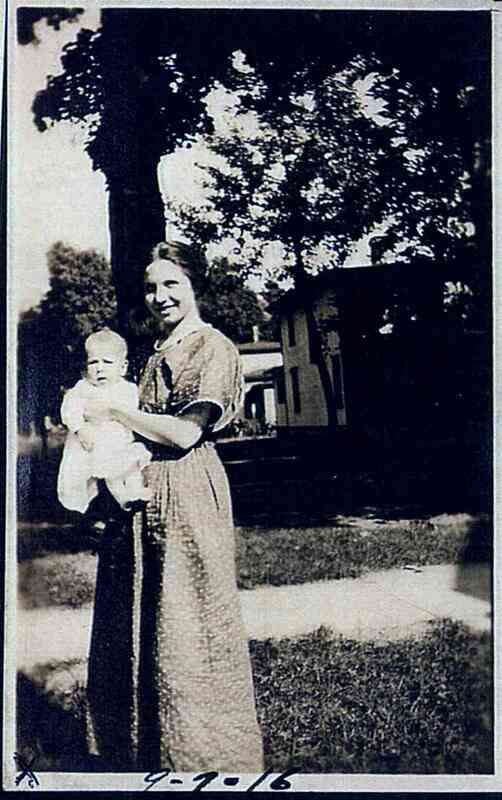 Name of spouse: Lillian, age unknown. 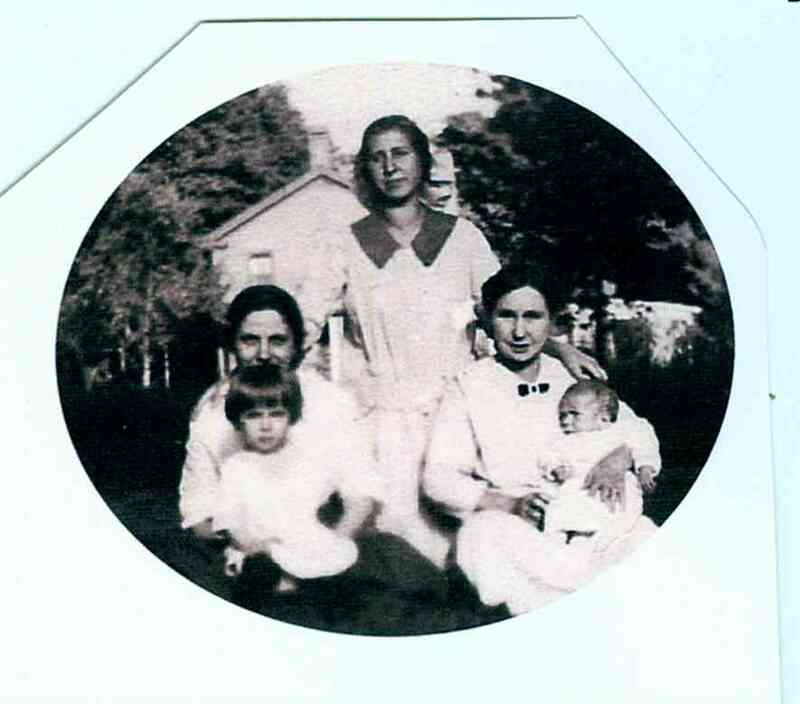 Name of father: Charles McCormick (dec.), birthplace unknown town, NY. Mother's maiden name: Mary Druien (dec.), born Chicago, IL. Informant: Juanita A. Backe of Hines Veterans' Hospital. Date of death: December 1st 1947, 10:11 a.m. Physician W.F. Dobyns attended from Nov. 28 to Dec 1. No other conditions listed. No autopsy. No operation. 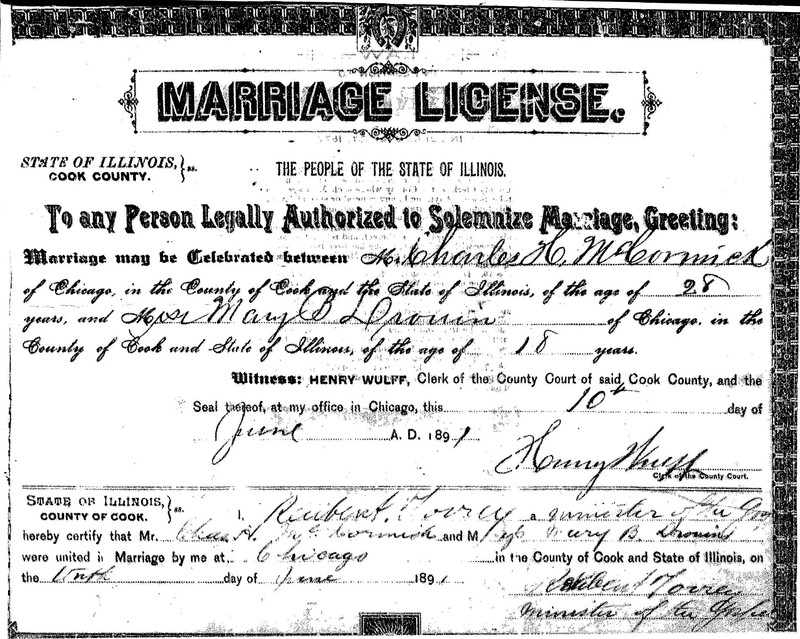 1900 census, Calumet township, Cook County, IL, possibly says Hanover St.
6-10-1891 Marriage License (in photo gallery above) allows marriage between Charles H. McCormick, age 28, and Miss Mary B. Drouin, age 18. 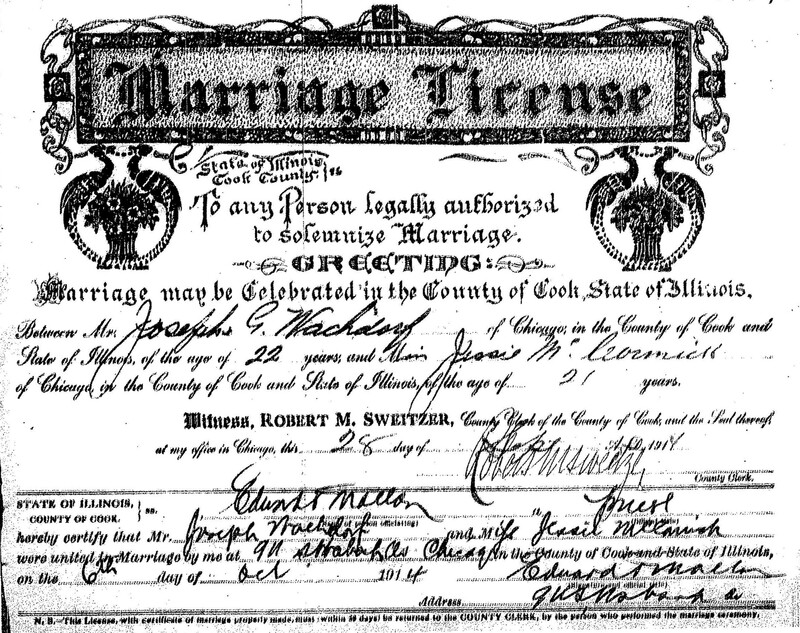 Reuben A. Torrey, minister of the gospel, certified that he performed the marriage 6-10-1891, though where a location would normally be listed (for example, "at St. Martin's Church") he has filled in "at Chicago." Research by Jessie's granddaughter shows that Reuben A. Torrey is listed on the Maromatha Bible Church website at the successor to D.L. Moody (D.L. Moody's ministry was supported financially by Nettie Fowler McCormick, the widow of the famous Cyrus McCormick).